The Complete Works franchise has made a name for their abridged retellings of everything from Shakespeare to the history of sports. So when others try to tackle this idea you have to be prepared to do it better. 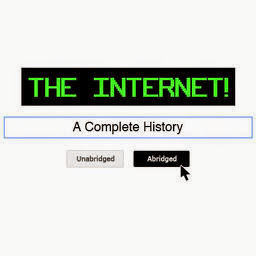 In The Internet: A Complete History (Abridged), writers Kristyn Pomranz and Katherine Steinberg attempt to inform and entertain while borrowing the perfect concept. While we all use the Internet, very few of us actually know anything about it. Well besides that it was "invented" by Al Gore. And who better to teach the history of the World Wide Web than Gore himself! With the aid of two youngsters and a begrudging "audience member" we learn about the Internet. Unfortunately for Pomranz and Steinberg, the Internet is just not funny. With projections to explain the jokes and way too much jargon for the audience to handle, The Internet is a prolonged set up that tried to be something else. The Internet is funny when it's a nostalgia trip down 90s memory lane but it takes about as long as connecting to dial up AOL for the funny to come. When engaging in fact spewing, the play falls flat. Had the entire play been bits and sketches like the Reduced Shakespeare’s Abridged shows, perhaps The Internet could have worked. Benjamin Drew Thompson tackles the role of Al Gore in a unique way. His Gore borders between impersonation and it's own identity. He nails the accent but lacks the pacing other Gore impersonators use. You know like Darrell Hammond. Lockbox anyone? Callie Rose Hanau and Timothy Thompson as Gore’s sidekicks in story have their moments, with Thompson receiving more of the meaty material to play with. As Steve the audience member turned insider, Adam Wennick is lost. Director Paul Morris struggles to salvage any comedy from within. Morris keeps the action fast paced but with so little to work with, the play becomes a mishmash of too much. And perhaps that’s the point. A parallel to the Internet containing so much it’s too much to handle. The costumes Matt Russoniello works for Hanau’s Ingrid and Thompson’s Andrew, paying homage to the Internet. However putting Al Gore in Red Converse was a confusing choice. Russoniello was also in charge of props. For a play about the Internet and technology, having zero real pieces of technology was a massive disservice. Sure, the actors tossed the “computers” around on stage haphazardly but the fact that the prop looked like a prop and not an actual computer was disheartening. Comedy is hard. Originality is hard. Watching a comedy fall flat is hard. The Internet: A Complete History (Abridged) had all the makings of excellence but flopped in execution. If you were really curious, it may have been easier to learn the history of the Internet on the Internet.